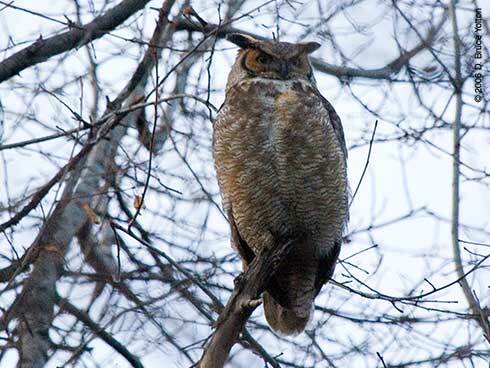 The Great Horned Owl that arrived on December 18th appears to have left the park on Friday evening, January 27th. It was great fun while it lasted! 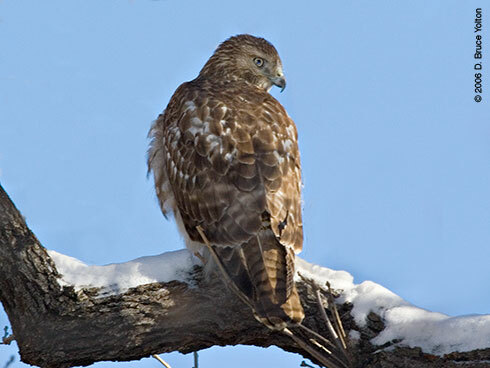 Sunday, I found two immature hawks, a Cooper's Hawk and a Red-tailed Hawk on Pilgrim Hill. 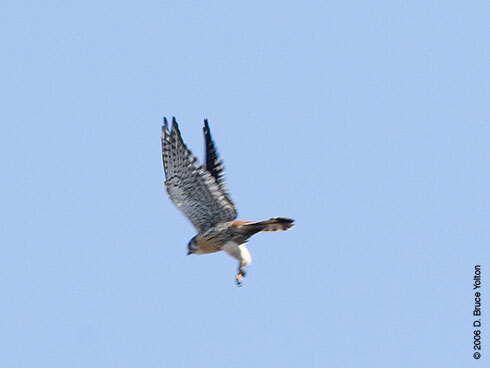 The smaller Cooper's Hawk was chasing the Red-tailed Hawk! They made their way southeast to the lawn above the Zoo around 70th Street. 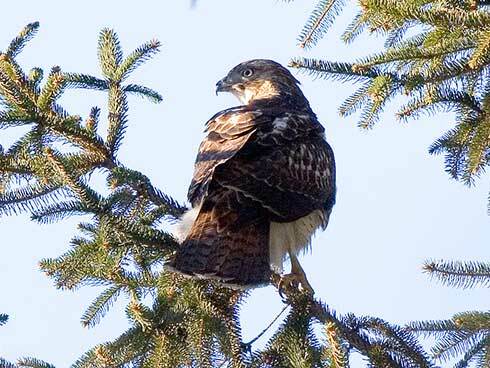 The Red-tailed Hawk hid in a low tree, and the Cooper's Hawk gave up and flew off. 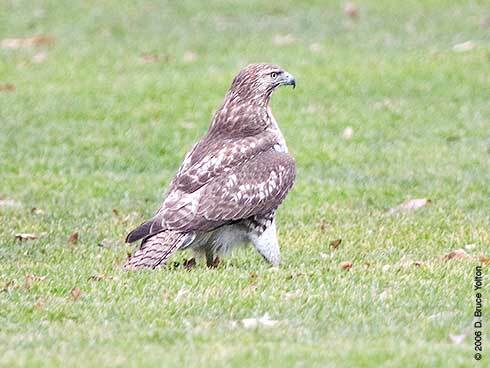 The Red-tailed Hawk soon relaxed and walked around the lawn for a few minutes before flying off, after two young boys yelled, "Pale Male, Pale Male, I found him first, no, I did, I did." James, Ben and I took the bus down to Central Park from Harlem. 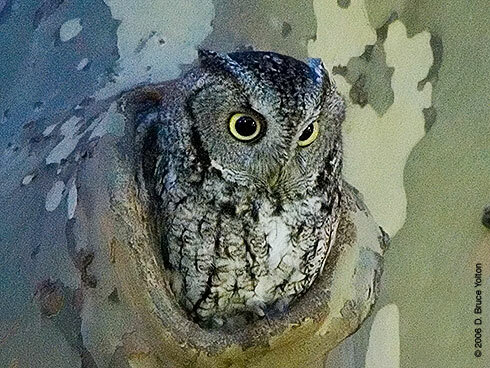 I wanted to try and capture photographs of the Eastern Screech-Owl, I had seen earlier in the week. 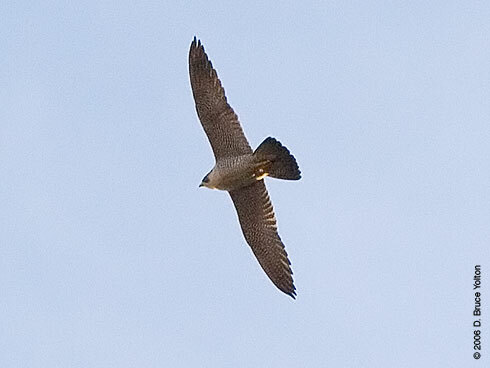 As soon as we get off the bus at 110th Street, a Peregrine Falcon appears overhead. 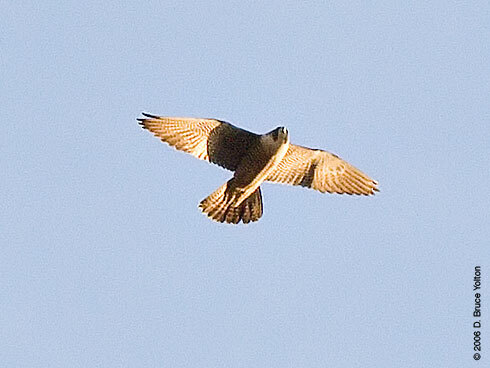 This was a new bird for my Central Park list. 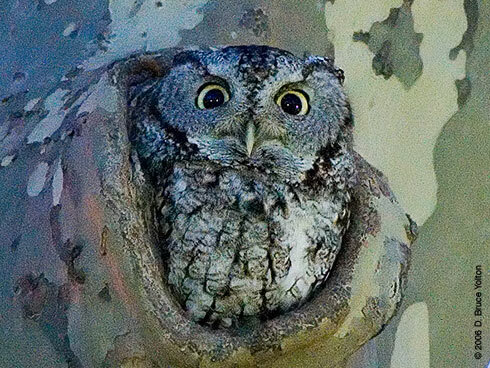 We then walked to the location of the Eastern Screech-Owl and I set up my camera. On Wednesday night, it was so dark at the fly out I couldn't focus my camera. So, I set up well in advance this time. While I was waiting both Ben and James went birding. 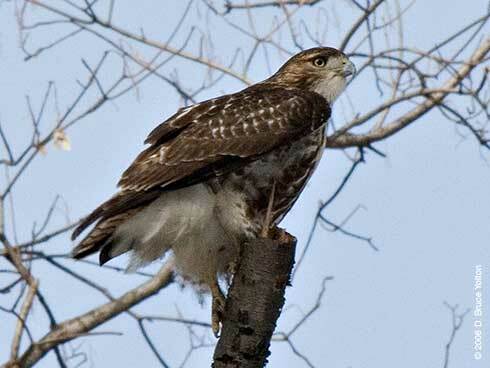 While I sat looking at a tree hole, an immature Red-Tailed Hawk flew into a nearby tree. 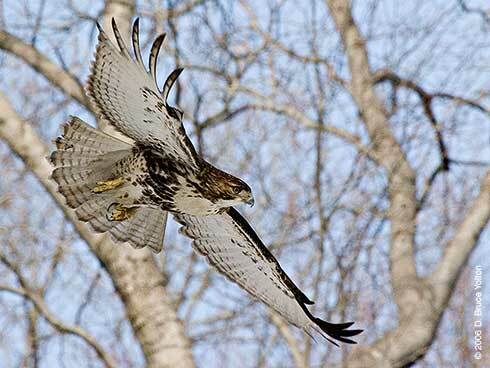 An adult was also spotted flying by, so we had a 7+ Red-tailed Hawk day. After the distraction of the Red-tailed Hawk, I reset my camera equipment. 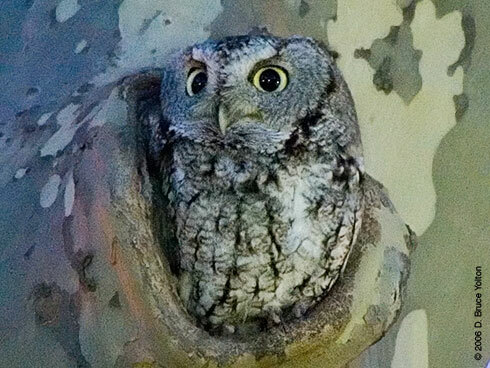 I was rewarded just after nightfall by the appearance of a beautiful Eastern Screech-Owl. About two weeks ago, James (blogs at yojimbot.blogspot.com), who I had met briefly while watching the C.P.S Red-tails last summer, viewed one of the Great Horned Owl fly outs with me and a small group of birders. 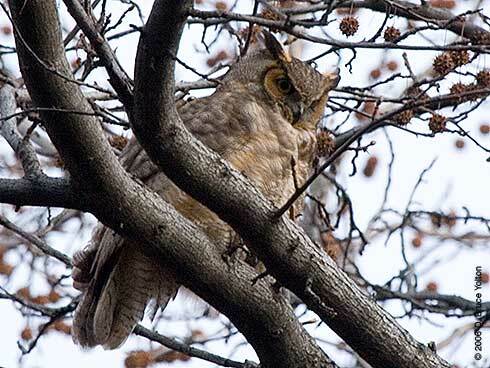 After the fly out, a few of us were able to follow the owl to a tree overlooking the lake. 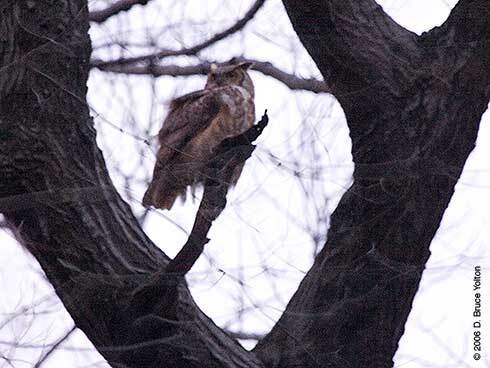 As we sat on a bench watching the owl, James talked about his experiences hawk watching in Harlem and Washington Heights. 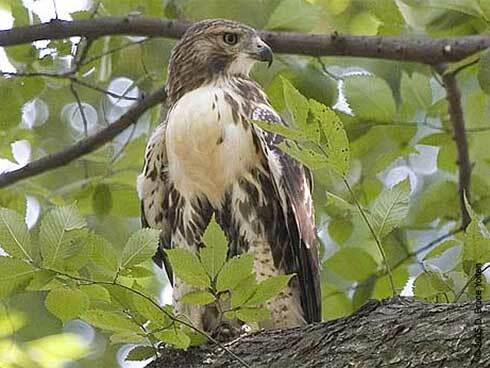 His tales of Red-tails and other raptors in Harlem seemed like a tall tale at first. 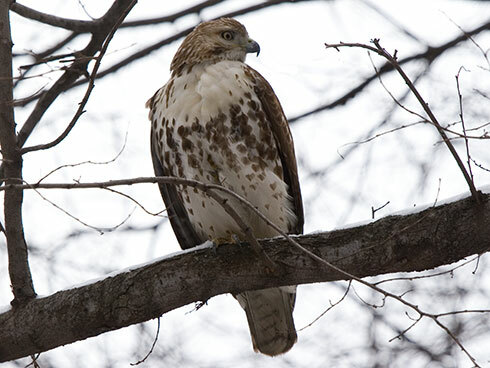 But I soon began to understand that he really had studied the raptors of Harlem, learning who was who, discovering field markings of individuals and had studied his neighborhood very well. I gave James my email address that evening but didn't hear from him again. I didn't get his email address so I couldn't contact him. I kept thinking about James and Harlem though. One of the questions the very urban behavior of the C.P.S. 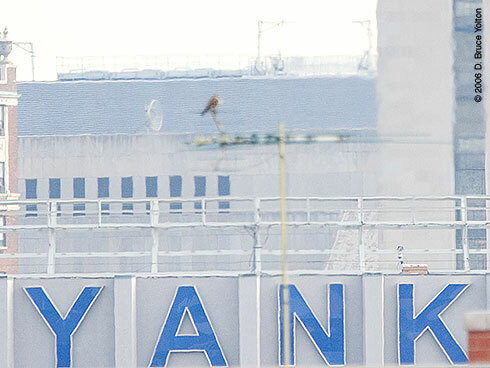 hawks raised for me last year was, could Red-tails become as urban as American Kestrels? 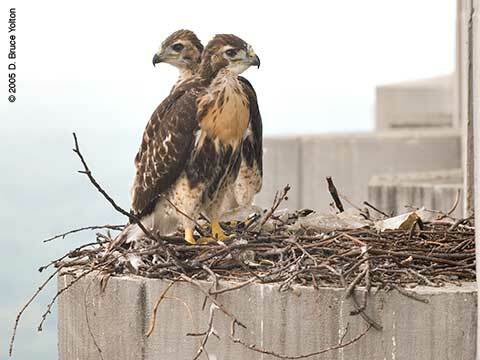 If a Red-tail Hawk learns to feed on pigeons roosting below a water tower above a Starbucks, chooses to build a nest 35 stories high, and even roosts on a 60 story office building, where will this end up? By coincidence, Ben (blogs at novahunter.blogspot.com) wrote me that he had discovered my blog. Ben, one of the best hawk watchers I've met, had also watched the C.P.S. Red-tails last summer. Somehow, James name came up as we discussed hawks, and it turned out that Ben had gone birding in Harlem with James on the M.L.K. holiday. So, I asked Ben, if he would please ask James, if I could come along the next time they went hawk watching in Harlem. Very quickly, a Saturday, 1-28-06, bird watching trip was organized. I arrived at 10 am at James' apartment, which is near the 145th Street A subway train station. Before I had my coat off, I was told to quickly look out the living room window, which faces south. 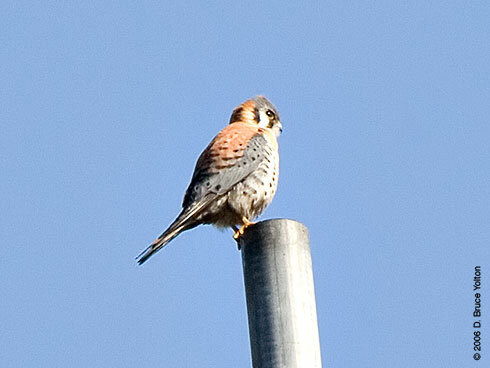 On the top of a distant housing project was an American Kestrel (10:05 am). 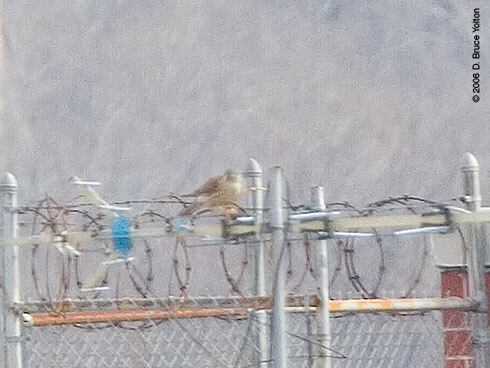 Soon a Red-Tailed Hawk landed nearby (10:10 am), only to incite the Kestrel. So, by 10:10 am, I had seen more than I had hoped for in Harlem. 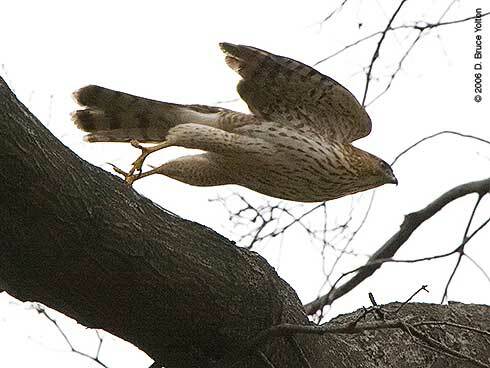 Soon thereafter, a young Cooper's hawk quickly flew past. 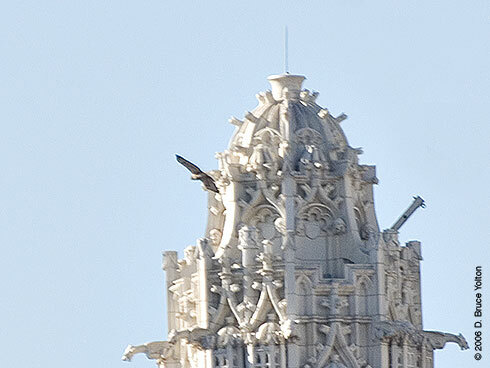 At 10:35 am we had another Red-tailed hawk going towards the buildings at City College. 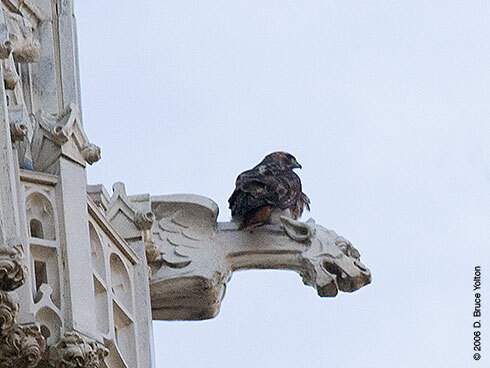 So, we have an American Kestrel, a Cooper's Hawk and two Red-tails all without leaving James' apartment building! Ben had birded with James in St. Nicholas Park before, so on Saturday for a change of pace we went north. 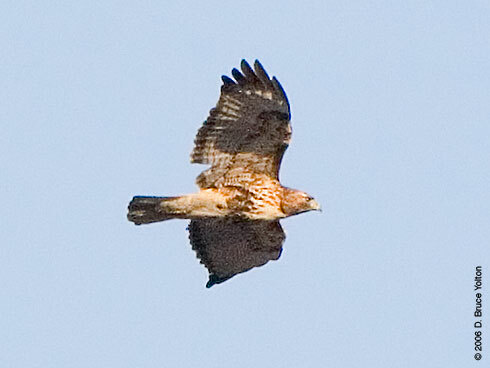 While walking north along the top edge of Jackie Robinson Park, we soon had a Red-tailed Hawk far in the east (11:16 am). 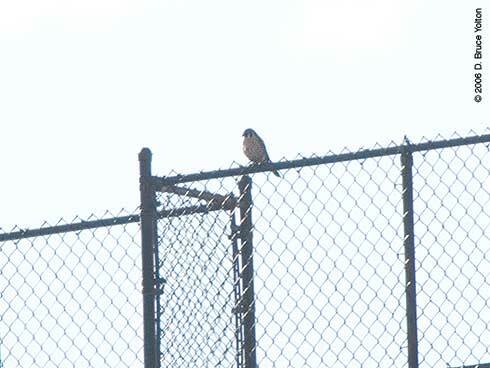 Then we had another American Kestrel (11:17 am), perched on an antenna with Yankee Stadium in the background. 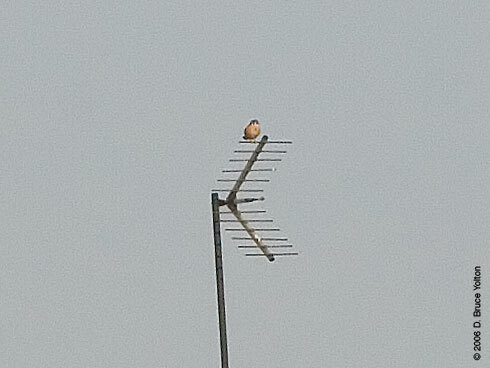 The Kestrel reappeared after catching something and ate it atop what looked to be a barb-wired fence. 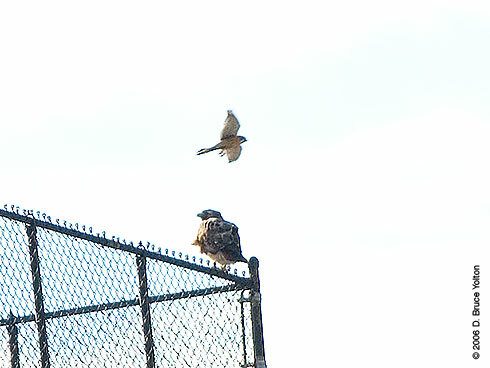 Moments later a Red-tailed Hawk lands on an abandoned school, to the South East (11:23 am). Having reached the end of Jackie Robinson Park, we do a little jog and we're at Highbridge Park. The park has an abandoned staircase that was once part of the entrance to the Polo Grounds, home to three baseball teams, New York Giants (NL) 1911-1957; New York Yankees (AL) 1913-1922; New York Mets (NL) 1962-1963.
we spot an adult Cooper's Hawk (11:45 am). Soon the Cooper's flies south. As we walk along the neglected park, I can only wish that the wealth of the Central Park Conservancy could somehow also adopt these little green strips and return them to the glory of years past. Northern Manhattan deserve parks without crack pipes, weeds and broken glass. While walking north, we walk under the Cross Bronx Expressway and the Washington Bridge. 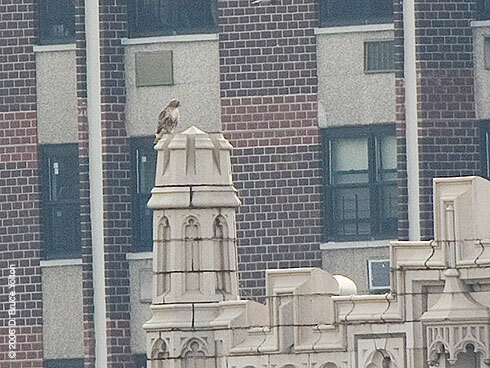 Across the river over the Bronx, we see another Red-Tailed Hawk (12:10 pm). We then make our way through a little crack den, up back to Amsterdam Avenue. 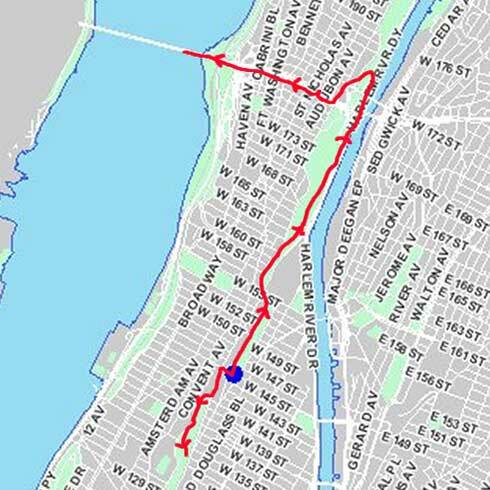 Back on city streets, we walk south and then go west along 178th Street in search of lunch. This is the southern edge of the Cross Bronx Expressway. 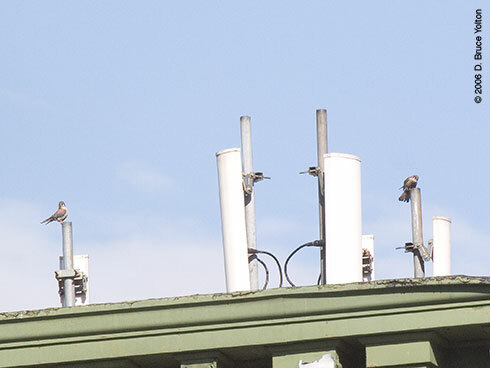 When we get near Audubon Avenue (yes, Audubon Avenue) across the highway on 179th we spot a pair of American Kestrels (12:32 pm) on a cell phone installation on top of a small three story building. 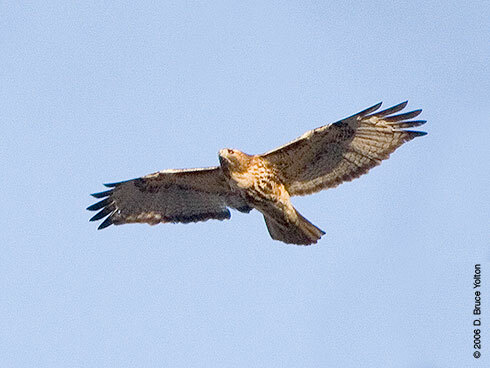 And yet another Red-tail passes overhead. 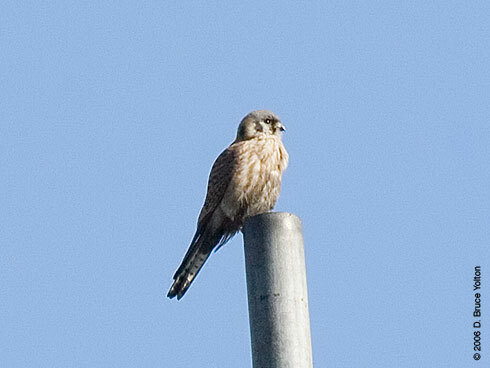 We walk closer to the Kestrels. We then stopped for lunch on Broadway after finding a small restaurant. I know I'm not in midtown when the menu is in Spanish, with the English translation in tiny type. But I really know I'm not in midtown, when our check is $26 for three people. After lunch, which took forever to come, we went off to the George Washington Bridge. 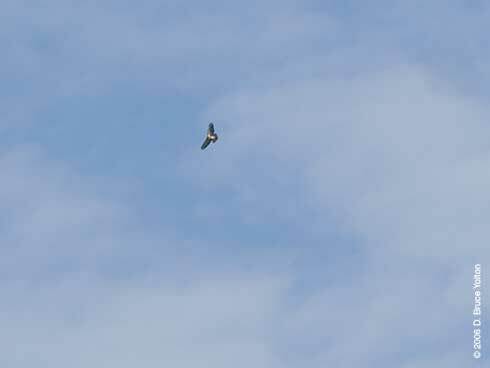 Ben spots three Turkey Vultures (2:20 pm) over the Palisades, our fourth raptor of the day. It was a crystal clear day and you could see up and down the river. I'm not so good about heights, the bridge shakes, and there were lots of speeding bikes, so I was prepared to turn back. But James, you know these urban pioneers, fearlessly walks out past the first tower and motions for me to come out. 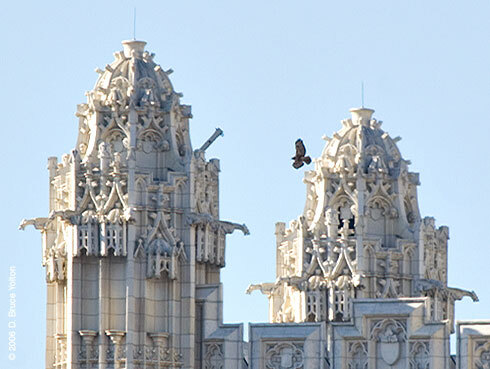 Atop the first tower is a Peregrine Falcon, our fifth raptor of the day (2:26 pm). Five raptors for a $2 subway ride. Not a bad way to spend a Saturday. But the day's not over, James and Ben want to show me St. Nicholas Park. I agree but also request that we run down to Central Park, so I can try and photograph an Eastern Screech-Owl at dusk. So, we take a short ride on the A train to 145th, pick up our stuff at James' place and head out to St. Nicholas Park. 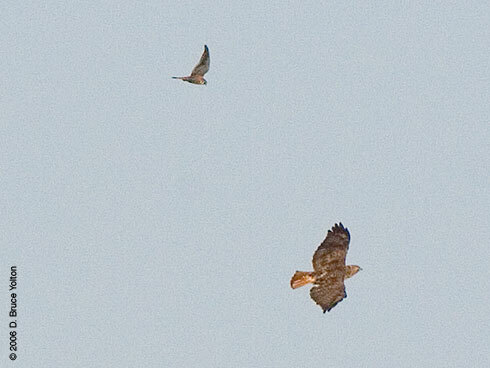 and then a Red-tailed Hawk (3:38 pm), who the Kestrel chases. 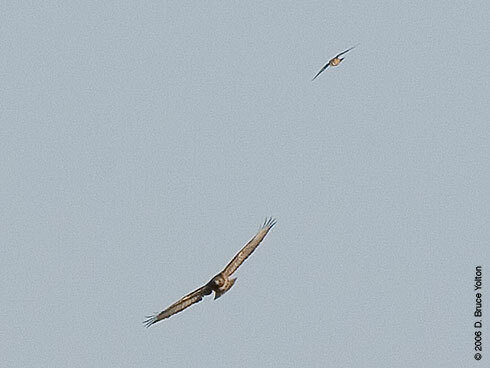 Soon the Kestrel looses interest in the chase and the Red-tailed soars in our direction. Being at the top of St. Nicholas Park gives me a perfect angle to take pictures. 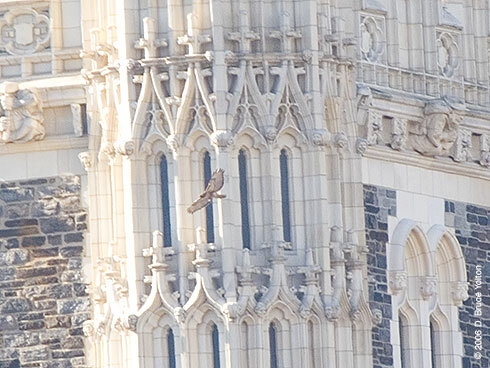 Finally, the Red-tailed Hawk lands on a City College building (3:40 pm). Then, we rush out of the park, so we can get to Central Park before dusk. 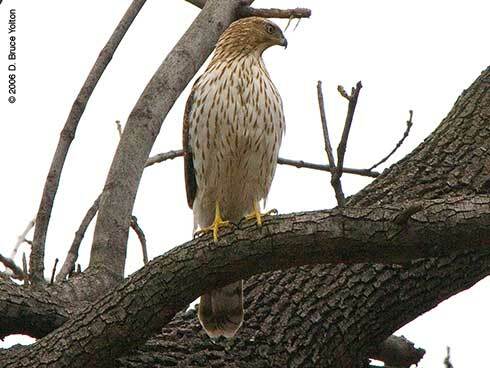 I've left out a few details, but James showed me via a five hour walk through Harlem and Washington Heights, that Northern Manhattan is just full of urban raptors. Thanks, James. It will be interesting to see what happens this spring and summer! 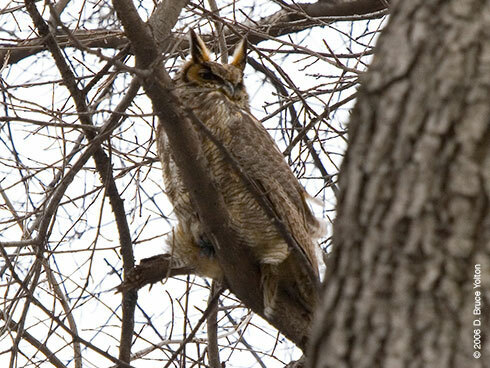 The Great Horned Owl returned to the Ramble on Thursday. Here are photos of the fly out on Friday. Tonight, I let the exposures reflect how the light looked to the naked eye as it got darker. 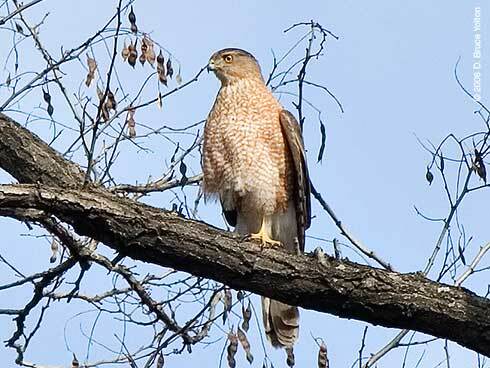 As more hawks are being seen in the city, more and more we're seeing activity outside of the city's parks. 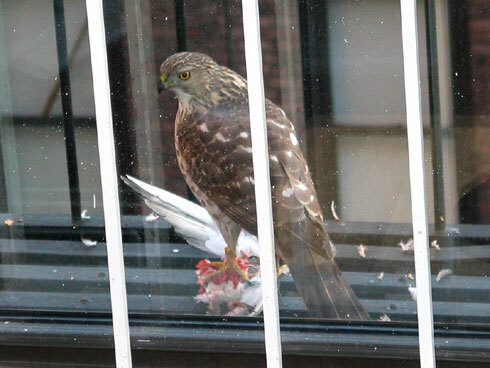 This is a photo from March 2005 taken by a colleague, Michael N. The fire escape where this accipiter, most likely a Cooper's Hawk, eat a Pigeon was near 14th and Eight Avenue. 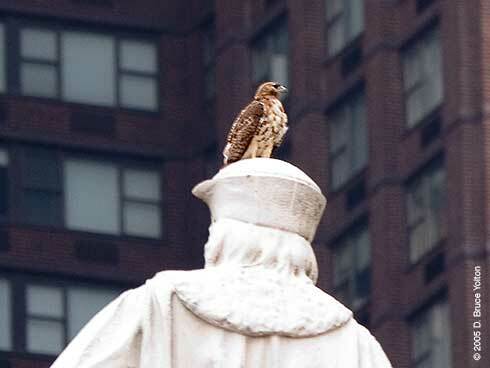 If you know of other interesting hawks in Manhattan outside of Central Park, please let me know. "At 7:21am Charlotte was on the nest moving all the twigs around, pulling a piece of black tar roofing inside the nest and pushing, pushing, pushing everything towards the middle of the nest. By 7:40 she was gone. Making room for the family." Wednesday was a wonderful evening. 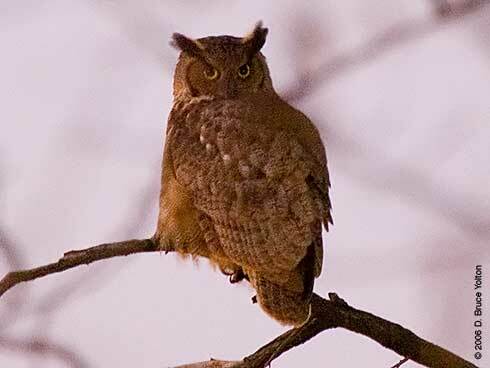 Our little group of five birders got to see two owl fly outs, a Great Horned Owl and an Eastern Screech-Owl. I was running late, having rushed out of my office to make it up to the North Woods. 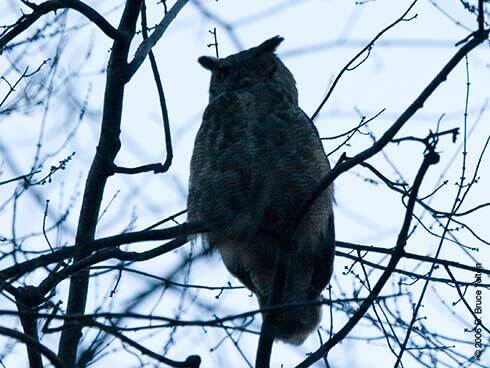 It was already dark when I arrived, and the Great Horned Owl soon flew out. 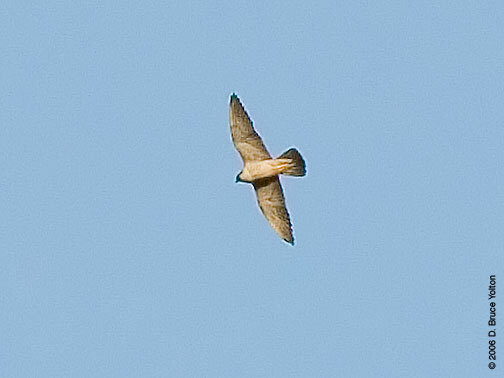 It stayed in the North Woods for a few minutes and then moved south to the North Meadow. Our little group of five birders then resumed our quest for the Great Horned Owl. 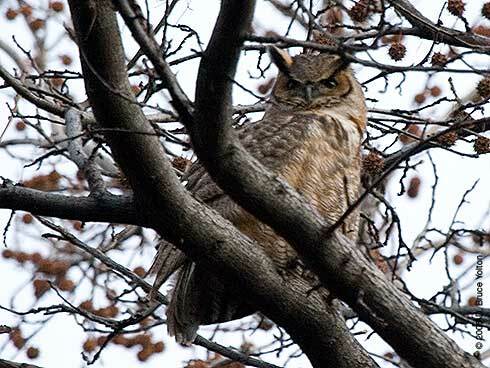 We walked south through the center of the North Meadow and in a tree overlooking the ball fields we found the Great Horned Owl. 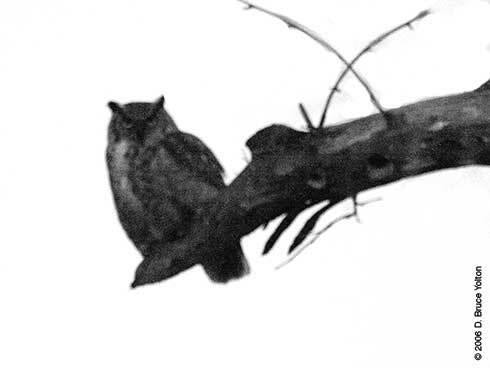 It stayed for about six minutes perched on a low branch. 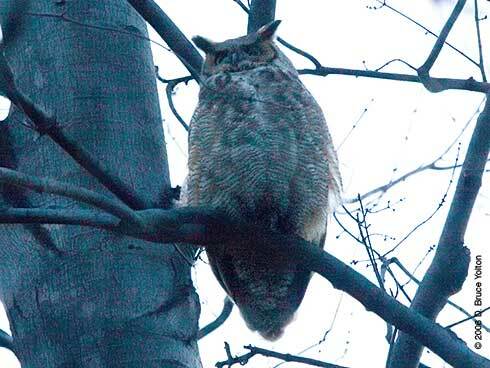 Update: On Thursday the Great Horned Owl returned to the Ramble. 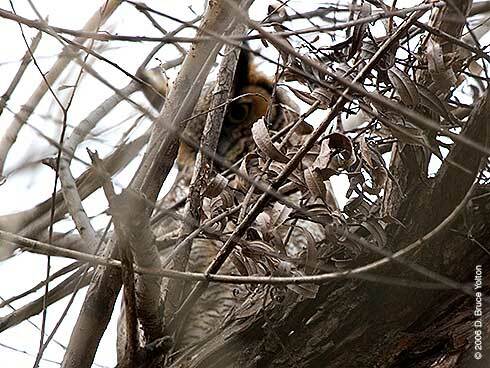 The picture below may the last one ever taken of the Owl in the North Woods! So, I dug up some old photos from the Riviera and the West Drive cavities. 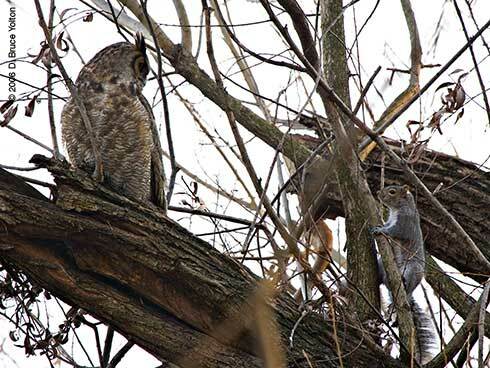 The first two owls are from the East Side and the second two owls are from the West Side I'd say we have (had?) four owls, but you could argue three. 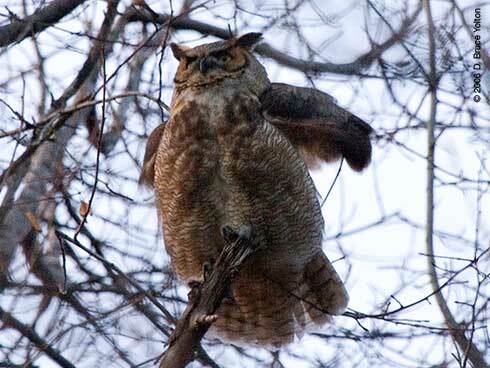 On Sunday, the Great Horned Owl was in the North Woods for the second day. It had chosen a much safer location than its Saturday tree. It was in a much quieter and more secluded area. 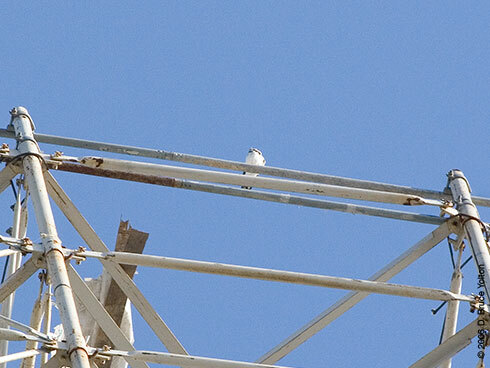 It had also chosen a higher perch. 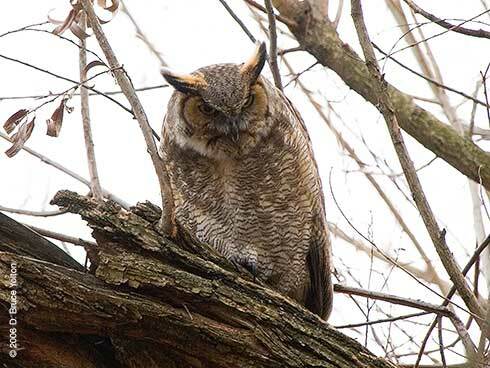 Unlike on Saturday, when the owl was wide awake and alert most of the afternoon, on Sunday the owl for the most part looked to be sleeping, opening its eyes and turning its head only on a few occasions when I saw it around 2 p.m. 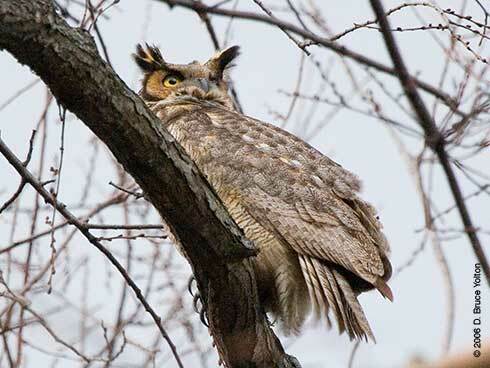 If you go birding in the North Woods, please keep the noise levels down around the Great Horned, keep your distance and avoid flash photography. We have a day sleeper who needs some shuteye as our guest! Let's be good hosts. 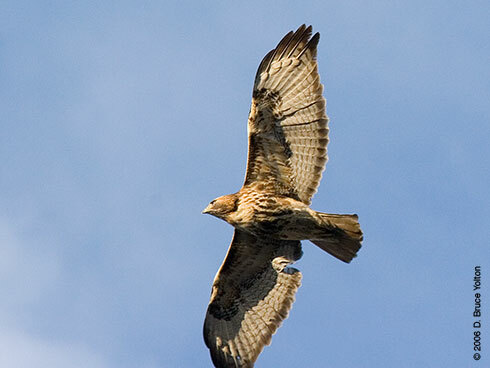 The American Birding Association has an excellent Code of Birding Ethics. 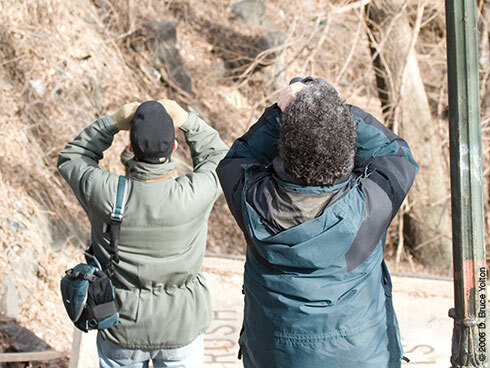 It's great reading, and reminds advanced birders to coach newer birders about birding etiquette. I went birding with a few Trump Parc Hawk Watchers from last summer on Sunday morning. We got to see a Rusty Blackbird near Laupot Bridge in the Ramble. After a few minutes of its normal behavior of walking along the creek bank, it flew up into a tree and started to sing. With each song, it fanned its tail. 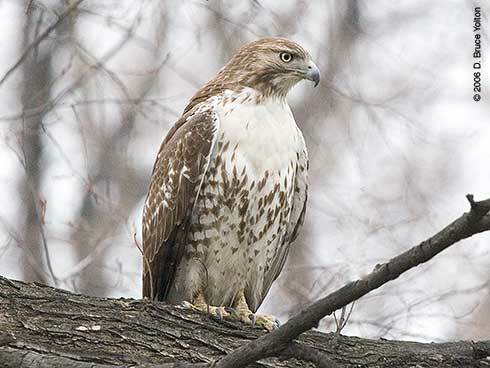 After hearing reports of the possibility of Buteo hawks other than Red-Tails in the park, I went birding on a wonderfully warm Saturday starting at 105th and 5th Avenue hoping to find a new hawk species for my Central Park list. I walked past the Meer which had an interesting selection of birds: 2 Mute Swans, 3 female Wood Ducks, an American Coot, a male Gadwall, 2 Buffleheads, a few Ruddy Ducks, Mallards, Canadian Geese, and Ring-billed Gulls. As I walked through the North Woods, I heard an incredible number of jays harassing something on a path. 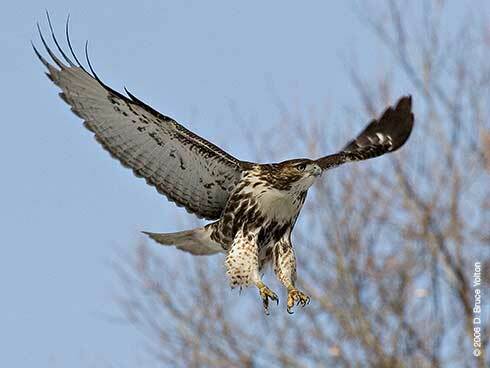 Oh, great I thought, a new hawk! I went around and saw not only Blue Jays but Tufted Titmice, White-breasted Nuthatches, and a Downey Woodpecker all around one tree branch. 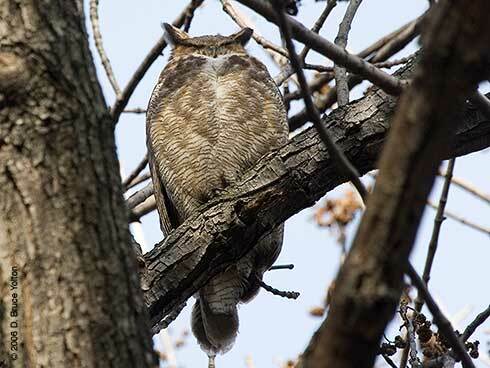 Tucked behind a number of branches wasn't a hawk, but a Great Horned Owl. Most likely, the one who has spent the last month roosting in the Ramble. 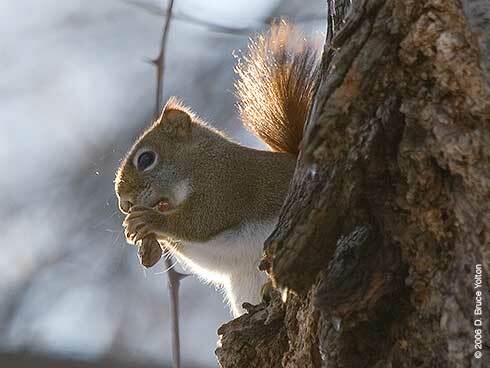 Squirrels are just as inquisitive in the North Woods as they are in the Ramble. 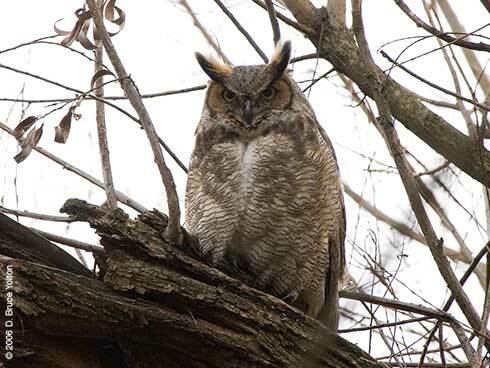 The Owl kept an eye on dogs and children while I was there, but the combination of a gentleman with very loud boom-box and a passing weather front (very dark clouds and high winds for about fifteen minutes) spooked the owl. It first moved to a tree about 20 feet north, for a few minutes. It then went to a branch on the largest tree in a meadow. After about fifteen minutes of stretching and preening (Plus two appearances by a bat. A bat in January!!!) 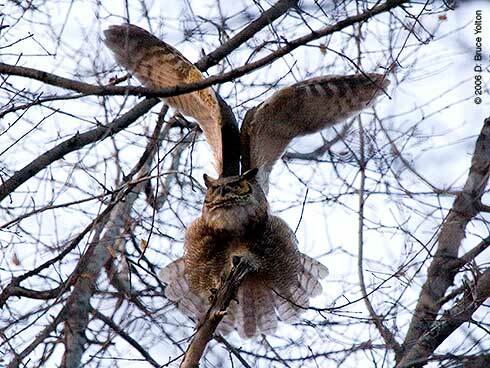 the Owl makes it way from tree to tree going southwest. 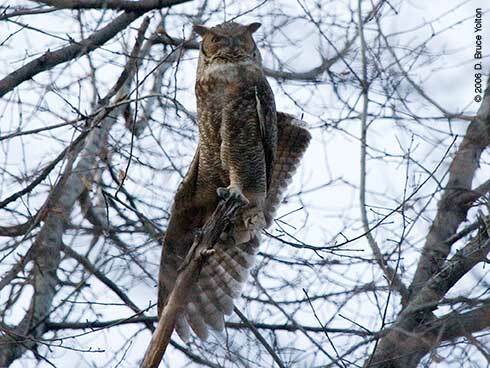 After a few minutes the Owl then took a long trip south out of sight. Some pre-fly out stretches. What should we call the last one? The DeLorean? 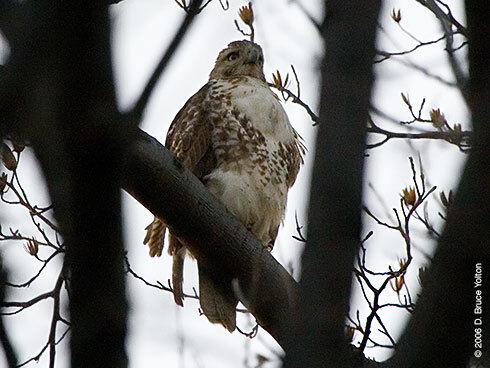 While in the Loch looking for owls, I saw this immature Red-tailed Hawk make its way north along the western path of the Loch (the stream/valley that runs from the Pool to the Harlem Meer between 103rd and 106th Streets in the center of the park). When it got to the northern end, it stayed for twenty minutes overlooking the skaters at the Lasker Rink. I spent the afternoon in the park, starting at 105th and Fifth, first exploring the Conservatory Garden (which I discovered has two stray cats living in the snow), the Meer and the Loch. I then went down to 79th and explored the Ramble. 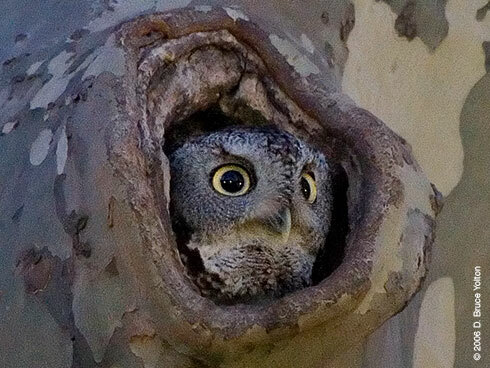 I had planned my day to look for owls of any kind. 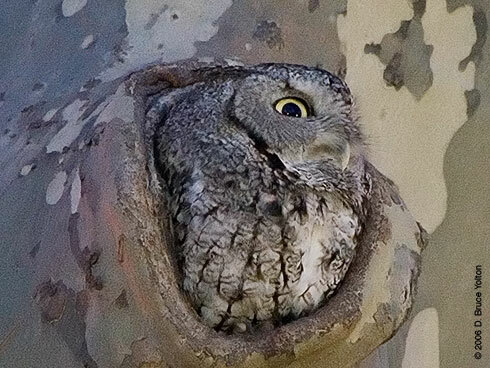 So, it was a hunt for tree cavities (Eastern Screech Owls) (where did the 5 Eastern Screech Owls we saw in the Spring go? 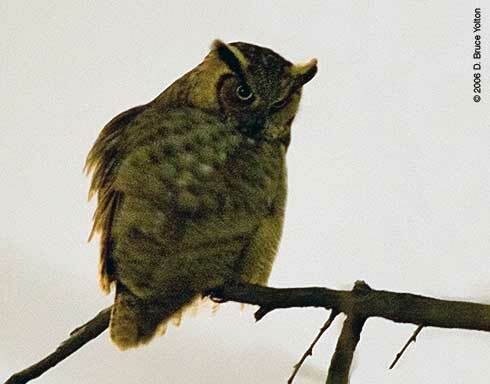 ), in bushes (Northern Saw-whet Owls), and Evergreens (Long-eared Owls). I didn't have any luck. 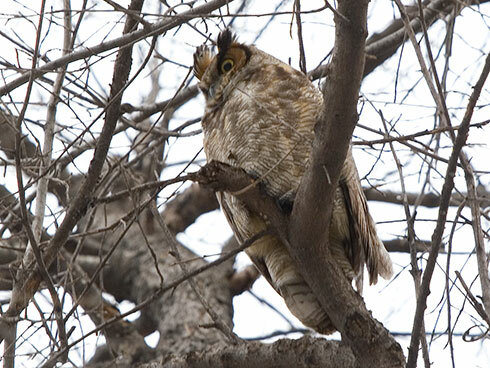 My only owl of the day was the Great Horned Owl, who had returned to the tree it had used earlier in the week. 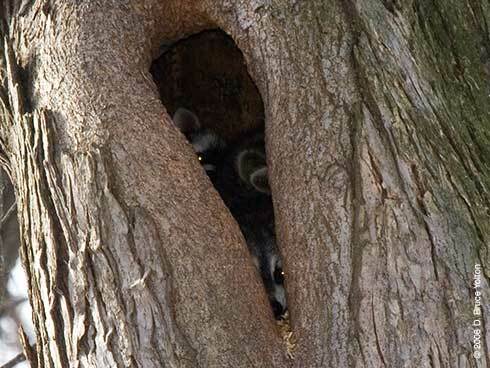 Like this raccoon den in the Loch, which for the first time revealed to me that it is home to not one, but at least two, raccoons. 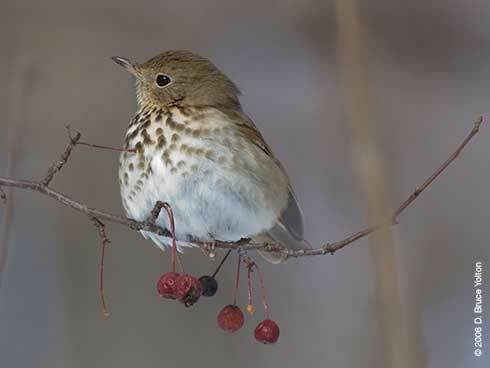 This Hermit Thrush eating berries on a tree branch rather than being on the ground. 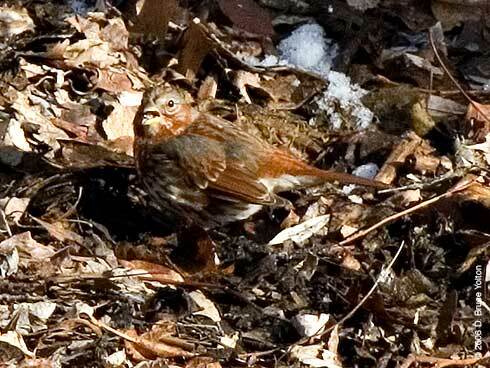 This Fox Sparrow, a new bird for my Central Park list. 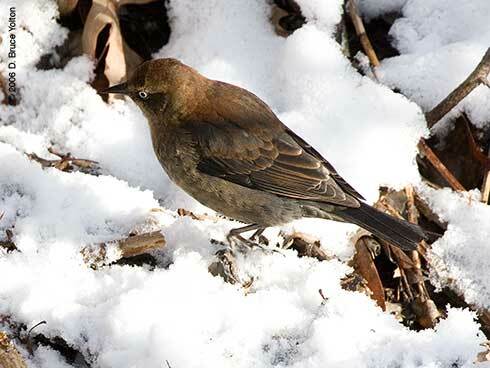 This Rusty Blackbird, another new bird for my Central Park list. While exiting the park, I went through the Locust Grove. 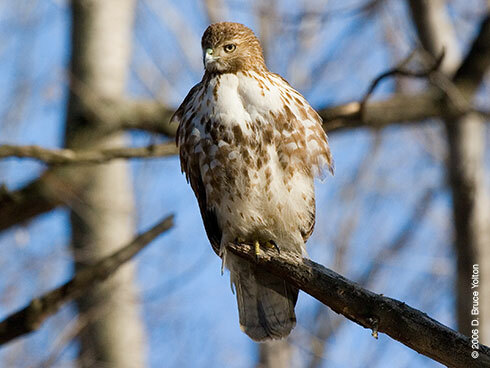 I got to see two Red-tailed Hawks and the Locust Grove's Red Squirrel. 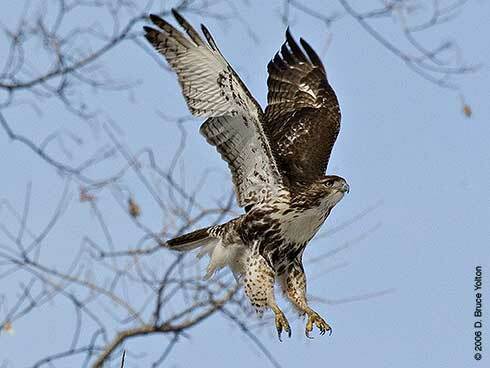 A Red-tailed Hawk flew quickly through the Locust Grove, stopping in an evergreen just long enough for me to get one picture. 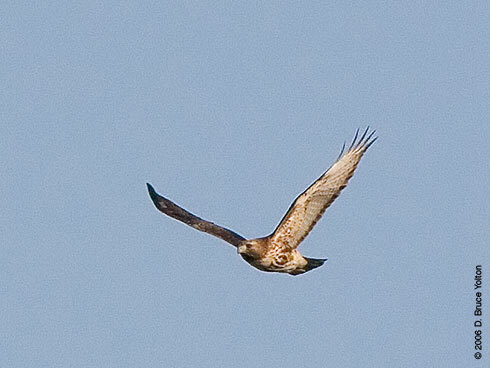 It left quickly with another Red-tail heading north. Too quickly, for me to I.D. either of them. I'm a little concerned about the Red Squirrel. 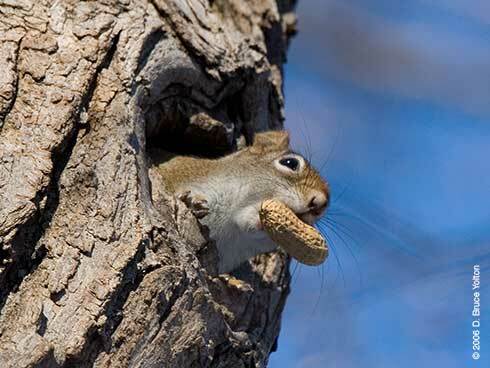 Someone had left a large amount of bird seed and a large number of nuts below his tree. This only made him need to defend his territory against the gray squirrels in the neighborhood. It's not a pet. I don't think it needs to be fed. 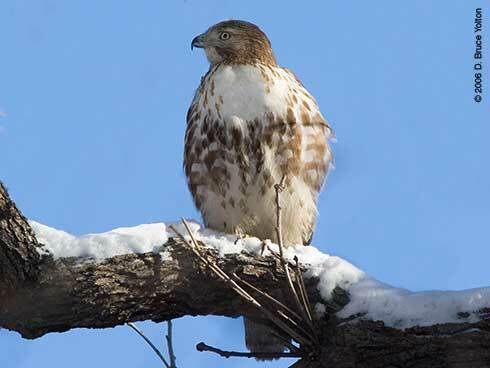 The bird feed had attracted a large number of birds, who in turn most likely attracted the Red-tailed Hawk. 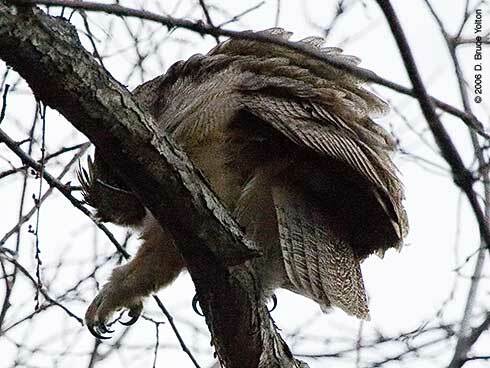 It would be unpleasant, if outcome of all this "helpful" feeding, would be that the Red Squirrel got eaten by a raptor! After some hot chocolate to warm up at the Boat House, I went back out into the cold. The sky had turned blue and the sun was bright. 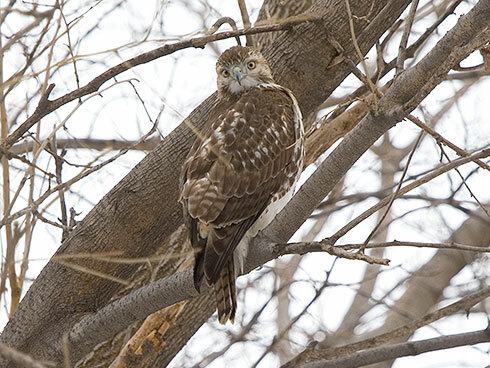 The Immature Red-tailed Hawk was in a tree near the bamboo south of the Oven, and spent 45 minutes moving into different tree limbs, and occasionally trying to catch something. 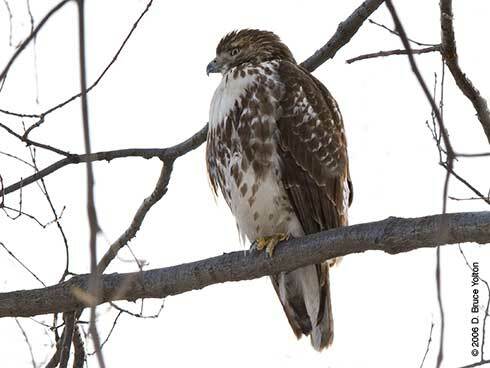 This is my first encounter with a immature Red-tailed Hawk this winter, that made me think, "Hey, that could be one of the Trump Parc fledglings." The pictures above are from Sunday, January 15. The picture below is from last summer. Please feel free to use the comments to voice your opinion, Yes, No or possible. The park looked wonderful with a light dusting of snow, Sunday. In the morning, it was cloudy and the paths were icy. 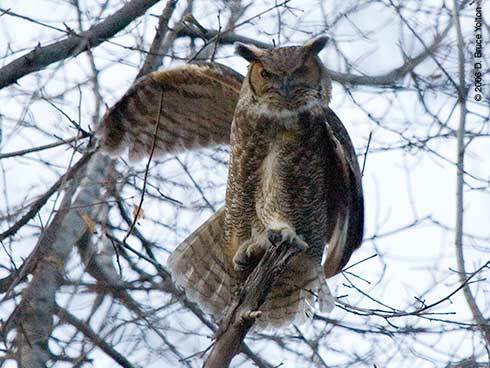 The Great Horned Owl had moved to a new location, NW from its previous spot. 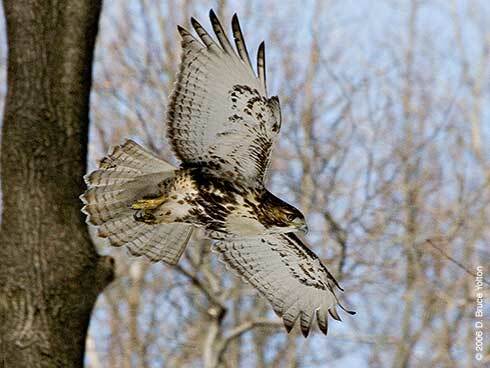 The Red-tailed Hawk soon returned and went to three different trees surrounding the GHO. 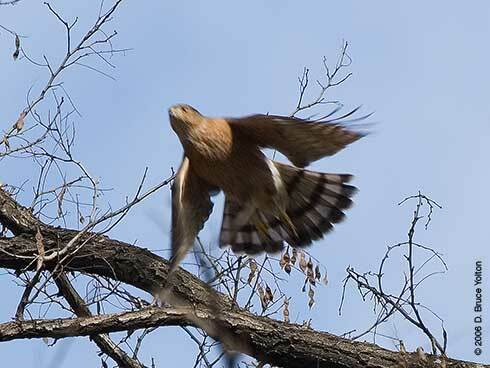 In the span of about 15 minutes, we were treated to four Hawk cries. 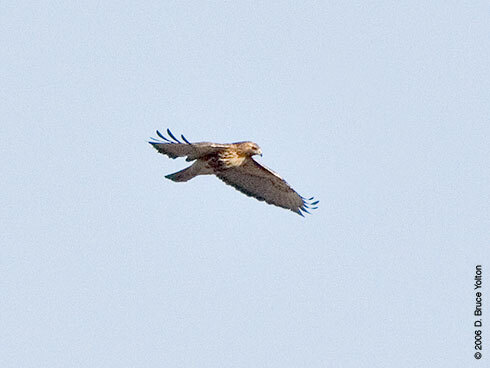 Then the Immature Red-tailed Hawk flew NE out of sight. 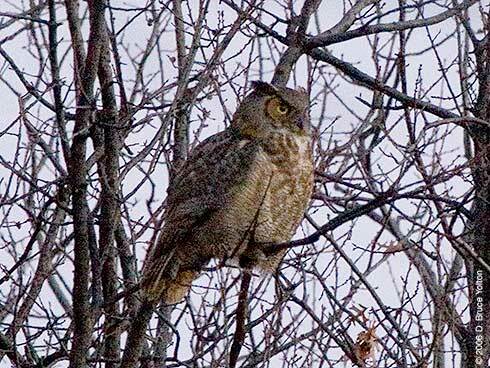 On a spring like evening Thursday, I was able to catch the Great Horned Owl fly out. 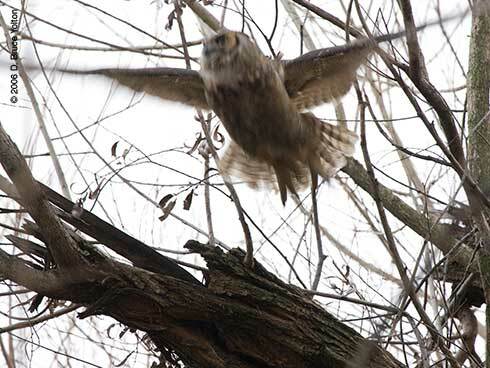 A group of hawk watchers was able to track the owl for over an hour after the fly out. Off to a tree on the Point. 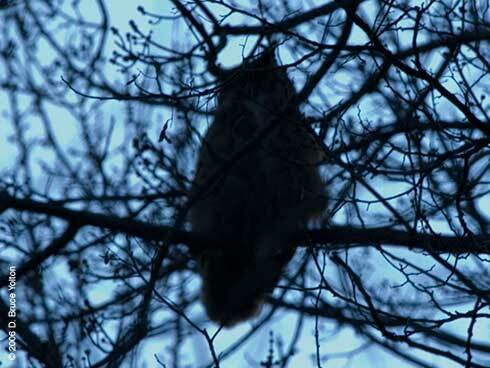 Then to the NE Shore of the Lake, where the owl stayed for over half an hour in the moonlight. Another photo in the moonlight. Veronica G., who has the good fortune to have a view of the Trump Parc Nest from her kitchen, reports that Charlotte was sitting on the nest this morning at 7:15 a.m. She also reports that the volume of twigs on the nest has increased. Let the fun begin, again! 2005 Trump Parc Nest with two 46 day old fledglings, July 18, 2005.